Inventory We are a resale marketplace, not a box office or venue. Ticket prices may exceed face value. This site is not owned by Barclays Center . The Barclays Center opened in 2012 as the new home to the National Basketball Associations Brooklyn Nets. In 2015 it became home to the New York Islanders of the National Hockey League. The Barclays Center box office is located at 620 Atlantic Avenue in downtown Brooklyn, New York. A major draw to the location is the ease of public transportation access. The arena has an approximate seating capacity of 19,000 and is estimated to cost over $1 billion in construction funds. Barclays Center tickets are already set to bring in Andrea Bocelli, Rush, Jay-Z and many other premier concerts. 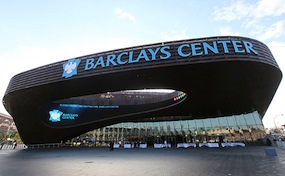 The Barclays Center will also be the new home to Disney On Ice, and the Ringling Brothers Circus. Barclays Center tickets have included events like the Rolling Stones, Barbra Streisands, Roger Waters, Paul McCartney, Neil Diamond, Elton John, Beyonce, and Cher. CenterBrooklyn.com is not currently affiliated with any official website, box office, venue, and or primary supplier. We are an independently owned and operated company that specializes in online retailing of all events in the secondary ticket market. Prices have a tendency to fluctuate above and below face value depending upon demand. To order tickets to all Barclays Center Brooklyn events please pick up the phone and call our operators at anytime or find the desired performance online and follow the steps through checkout.